New Delhi: The Embassy of Finland in New Delhi, together with Fortum India and Visit Finland, has brought a photo exhibition of the most spectacular phenomena of Finland – The Northern Lights – to New Delhi. 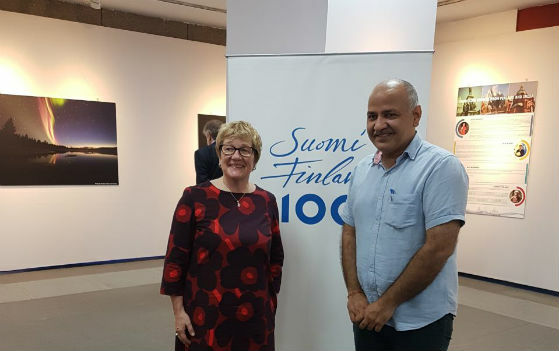 Inaugurated by Honorable Deputy CM Shri Manish Sisodia in presence of H.E Nina Vaskunlahti, Ambassador of Finland to India at Open Palm Court Gallery, India Habitat Centre, is a part of the celebrations of 100 years of independence of Finland. The exhibition is a unique opportunity to experience the magic of this nature’s spectacle through incredible images captured by six Finnish photographers. The exhibition will also be held in Kolkata, Mumbai, Chennai and Dhaka. People around the globe visit Finland to witness Northern Lights, also known as Aurora Borealis, which means the northern dawn in Latin. Unpredictable and usually appearing only on very cold nights in Northern Finland above the Arctic Circle, these enchanting illuminations have, through the ages, aroused feelings that they have magical powers beyond human comprehension. In Finnish this phenomenon is called ‘revontulet’, which means “fox fires”. According to a myth, The Northern Lights are painted to the night sky by a running fox sprinkling snow into the night sky with its tail. The auroras have also been said to be thunderstorms without thunder, like a storm that hasn’t grown to the point of releasing sound yet. To highlight the many diverse connections between India and Finland, the exhibition turns its eyes to the people of these countries. The exhibition presented nine Indians and seven Finns, who tell about their impressions and experiences of the two countries. The stories range from living in Finland as an Indian student to impressions of Delhi traffic by a visiting Finn. These stories celebrate human curiosity and the reward that comes from immersing oneself into a foreign culture with an open heart. autonomous Grand Duchy. Finland has had a parliament of its own since 1906. Independence of Finland was finally gained in 1917. Next articleKISS Cited in Anthropology Textbooks in U.S.